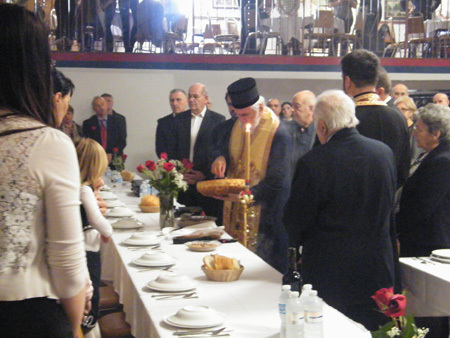 Windsor, Ontario - The Church Slava of the St. Demetrios the Great Martyr parish in Windsor was solemnly celebrated on Sunday, November 11, 2012. The Holy Hierarchical Divine Liturgy was served by His Grace Bishop Georgije of Canada. Assisting His Grace were V. Rev. Stavrophor Miroljub Todorovic, the parish priest at the Gracanica church in Windsor and V. Rev. Dusan Gnjatic from Holy Trinity in Kitchener and V. Rev. Jovica Cetkovic, the newly appointed priest at the St. Demetrios parish. The church choir added to the beauty of the service. The Epistle was read by the president of the church board, Zarko Vucinic. The pleasant 64 degrees served beautifully for the Slava Litiya afterwards at which a large number of faithful took part. The Slava Kolach and Koljivo was blessed at the church hall with this year's kum Goran Mickovic. Zeljko Bajic, together with his family accepted to be kumovi for next year's Slava. Members of the Kolo Sestara "Majka Jugovica" prepared the plentuous meal. The young folklore group "Mlada Srbijada" attracted much joy and excitement as they performed a medly of national dances. His Grace, in his inspiring homily, called upon the Orthodox faithful in Windsor to sacrifice and love among one another, love which is most needed today and with with our Lord Jesus Christ loves us.